Being fifty-something, I appreciate the finer things in life. Single malt whisky is one of them. Thanks to a family connection (on Mr P’s side) we’ve developed a taste for the single malt expressions from Islay, Scotland’s most famous whisky island. They’re peaty and smokey, earthy and warming … and definitely not for the novice scotch drinker. 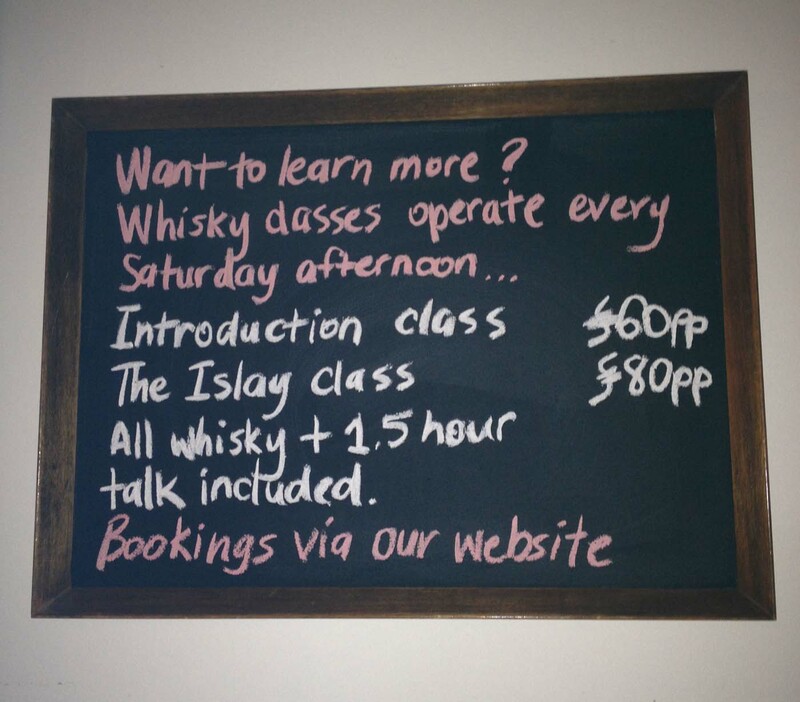 We recently took up an invitation to learn a little more about Islay and its whiskies at a Saturday afternoon “Islay Session” at Whisky and Alement, a Melbourne CBD whisky bar. In the tradition of fine whisky bars, Whisky and Alement is smallish, dark and intimate with the star of the show being an amazing, chock-full, beautifully lit backbar of gothic proportions, featuring the world’s premium whiskies. When we arrived, the tasting places were set, poured and ready for our delectation. The session turned out to be a 1.5 hour presentation delivered by the very knowledgable Julian, with a giant 200-year old map of Scotland as his backdrop. 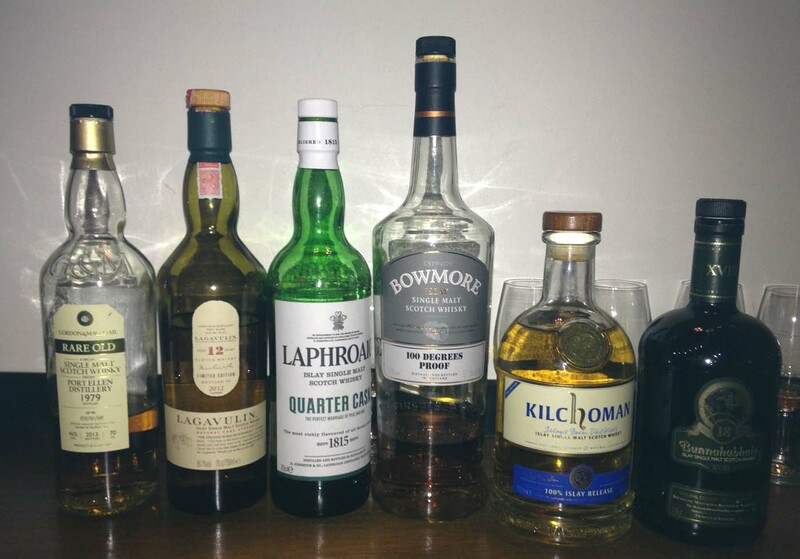 We officially tasted six of Islay’s finest expressions, with an additional Ardbeg dram unexpectedly poured at the end (when we thought things couldn’t get any better). 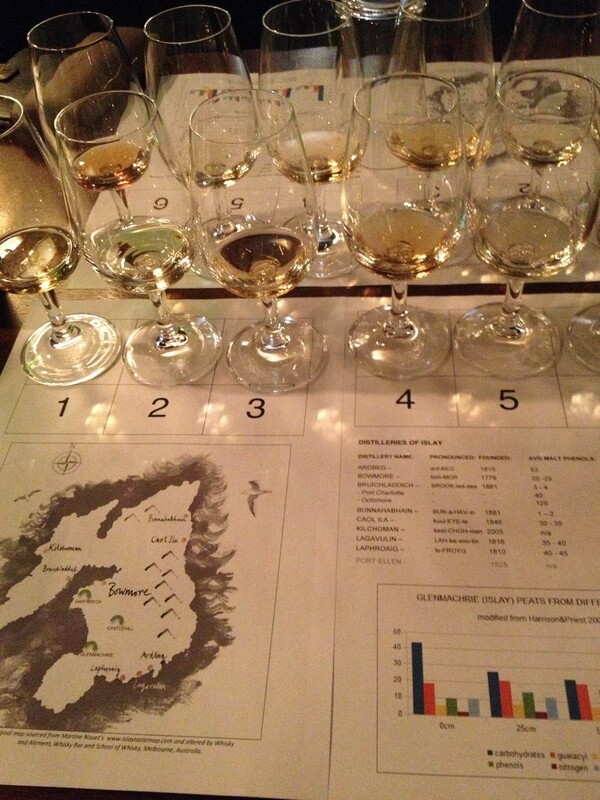 Julian had chosen the expressions to match his fascinating story of Islay’s history and tradition, and demonstrate how processing factors impact the characteristics of the whisky. 1. Learning about (and tasting the product from) Kilchoman, the only “single estate” Islay distillery where the barley and peat used are locally sourced and where every process, from barley to bottling, is carried out on the island (the other distilleries mostly have bottling facilites on the mainland). 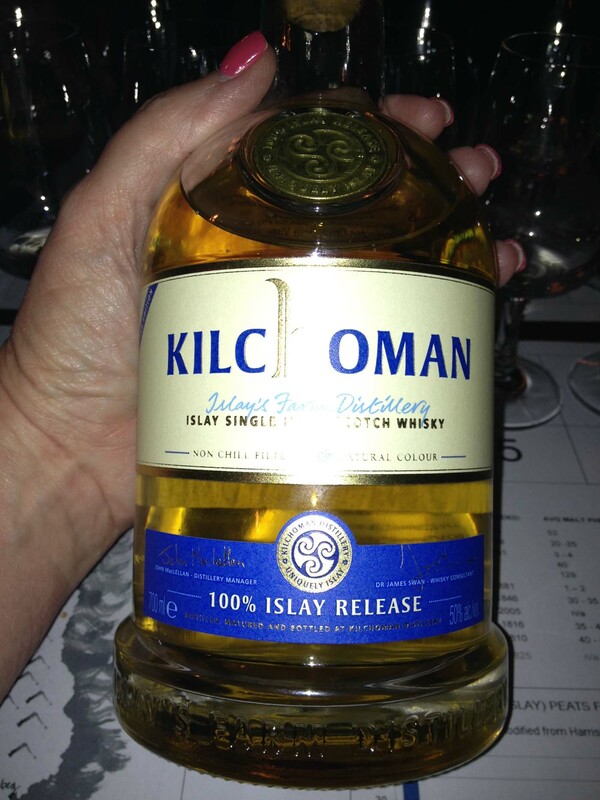 Kilchoman appeals to my sense of local … it’s like a “slow whisky”. It’s a new one to me. I’m expecting to hear more about it. 2. Learning how the term “proof” (as in 57% proof) was coined … (apparently) in days of yore, when illegal whisky distillers wandered the land selling their fare, there was no official method for measuring the alcohol levels. Sellers would pour their scotch over a small pile of gunpowder (yes, everyone carried gunpowder then), set a match to it and, if the powder ignited, it was “proof” of the alcohol level in the whisky. Sounds legit. 3. Tasting a dram from the now closed Port Ellen Distillery. These expressions are rare and expensive … the distillery has been closed since 1983, so this was an opportunity not to be missed. Memorable. Much. 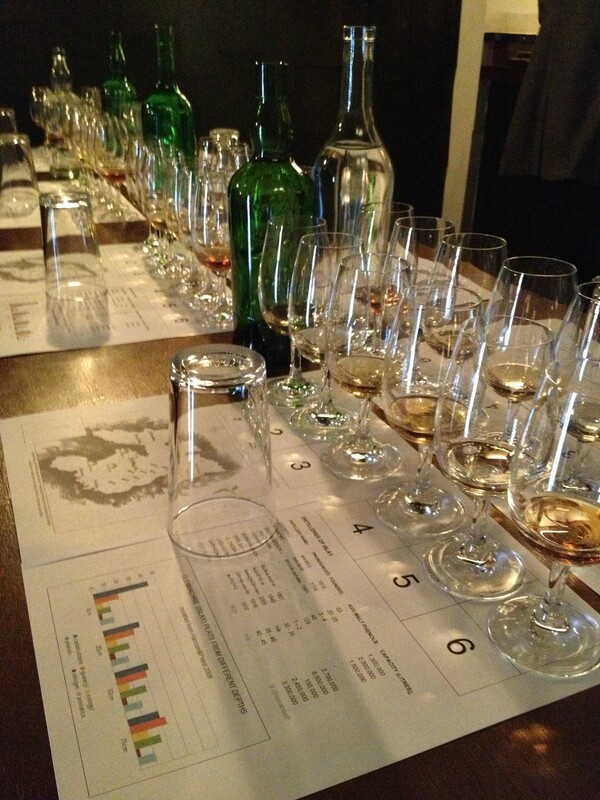 What an amazing afternoon and a fun way to learn and laugh along, fuelled by the warming goodness of some of the world’s finest whiskies. Because, as we all agreed, the world just seems a better place with a whisky or two poured into the conversation.